A lead magnet is a short, valuable, and specific piece of content that somebody can download from your website in exchange for contact information. You likely see lead magnets all the time without thinking about it too much. Ever been offered a free eBook, white paper, or assessment in exchange for your email address? That’s a lead magnet. The goal of the lead magnet is to start a relationship. To get to know each other. Getting a completely cold site visitor or social media follower to donate is challenging. Most people just aren’t going to click on that big “Donate” button if they don’t already know you and your work pretty well. So first you have to warm them up. They have to get to know you. But how can you do that unless you know how to get in contact in the first place? That’s where lead magnets come in. So what kind of lead magnet can work well for a nonprofit? It really depends on your specific audience and their needs. But one lead magnet used by many nonprofits is the petition. In fact, petitions are a great nonprofit lead magnet. When somebody signs a petition, you get the email address (or more) of somebody who supports your mission. That does not mean you just ask everyone who signed your petition for money. Remember, this is just the very start of a relationship. Almost nobody gets engaged on the first date. But it does mean you now have the means to start a conversation with a group of people who care about what you care about. And that’s a great start. Sophisticated online marketers test everything. This is a screenshot from a real, major nonprofit that you’ve definitely heard of. What does your donation page probably have in common with this? Nice round numbers. But just because this is how everyone does donation pages doesn’t mean it makes sense. Remember, one of the ways to increase your online fundraising is to increase the average donation amount. What if the nonprofit increased each default by $5? Would fewer people donate? Maybe not. And if not, that’s $5 more the nonprofit earns per transaction! If your average online donation was $50, this means you just increased your online giving by 10%. And all you did was play with the defaults. Now, by no means am I suggesting you should just raise the defaults as high as you can. You have to test what works for your organization. The key thing is not to assume that your default levels are optimized to bring in the most possible money. In fact, that’s unlikely if you haven’t done any testing. There are all sorts of psychological tricks that play into this… anchoring, decoys, avoidance of extremes, the path of least resistance… These are the sorts of tricks that expert marketers use routinely in the for-profit world. Here’s how you can best make use of these marketing tricks to increase online donations. The best e-commerce sites entice you to buy more stuff. Buying a Kindle? You can bet Amazon will try to persuade you, likely successfully, to also get a subscription to Amazon Prime, a case, and a wall charger. They’ll also get you to purchase ongoing content. So can nonprofits similarly upsell donation frequency? Charity: water gets held up as an example of digital goodness all the time, but there’s a reason. They’re really good at digital marketing. Now it’s true that some of what they do costs serious money, no doubt. But there are some things they do that are really smart and rather inexpensive. One inexpensive thing they do really well is focusing website visitors on just one thing at a time. Currently, the focus is entirely on recurring donations. Here’s the first thing you see on their website. The default here is a monthly donation. If you want to do a one-time donation, the button says, “OR SIMPLY DONATE,” implying this is clearly the less desirable option. Charity: water upsells at every opportunity. If you do click on “SIMPLY DONATE” the form still attempts to get you to make it monthly gift. And if you simply go to their main “DONATE” page, they put monthly donations on the left where most people would read first (heat map testing has shown time and again that people look down the left side of web pages first in an “F” pattern.) It’s just smart design. You almost have to go out of your way to not make your donation recurring. What charity: water understands is that some percentage of one-time donors will be willing, if prompted, to become monthly donors. This is the immediate upsell. The rest who simply become one-time donors will be put into an automated email sequence with the goal to nurture the relationship until such a time as they are able to convince you to become a recurring donor. 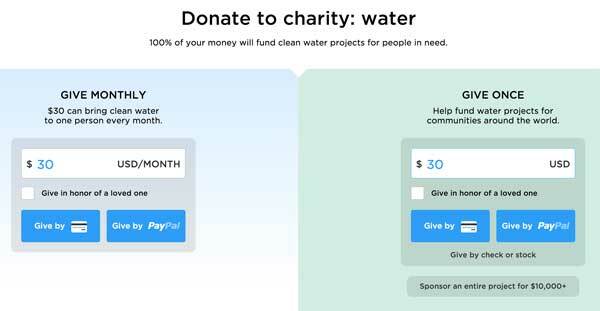 All of this can be done with some good design, a willingness to prioritize and focus on just one thing (easier said than done for most nonprofits) and most common donation platforms. It will almost certainly help raise more money. The bottom line is there are plenty of smart things you can do to raise more money that don’t cost very much. They just take some thought and planning. What are some clever things you’ve seen nonprofits do on their websites to increase fundraising? What else can nonprofits borrow from for-profit websites that will lead to more revenue? And if you’d like us to evaluate your website to look for opportunities to optimize donations, you can contact us here.